Back to beetle blogging – I hope everyone enjoyed their holiday break as much as I. One of the tiger beetles that I most hoped to see on my trip to Nebraska and South Dakota last September was Cicindela lengi (blowout tiger beetle). This is another one of the several tiger beetle species confined to dry sand habitats in the central/northern Great Plains (Pearson et al. 2006). Its common name would suggest it prefers sand blowouts, the most barren of dry sand habitats and where the co-occurring C. limbata (sandy tiger beetle) can be found. In reality, it also can be found in slightly more vegetated habitats such as dune margins, sand flats, and sandy roadsides along with the much more common C. formosa (big sand tiger beetle) and C. scutellaris (festive tiger beetle). 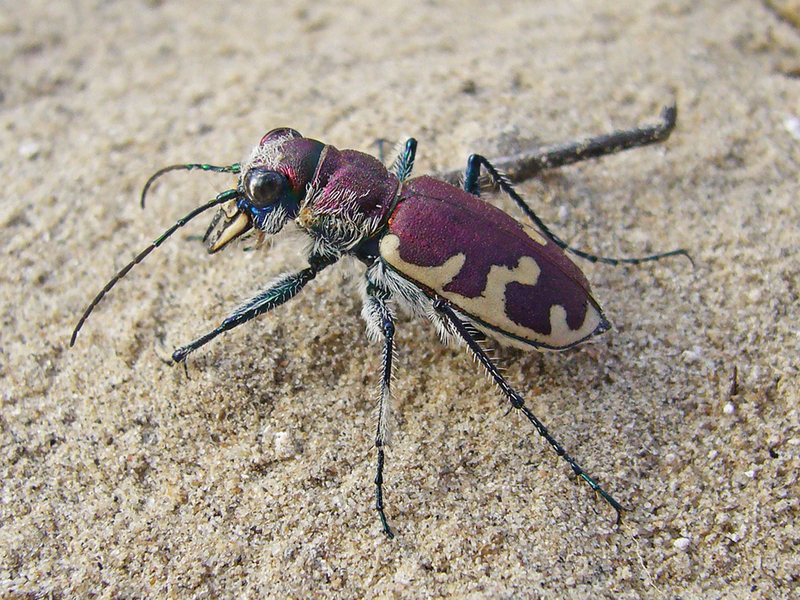 It can also be found occasionally on sand bars along rivers, where the aptly-named C. lepida (ghost tiger beetle) is likely to occur, and in the northern part of its range it even inhabits boreal coniferous forest along sandy roadsides. Despite its relatively loose habitat requirements, C. lengi is not a common species. In Nebraska it may be locally abundant (Spomer et al. 2008), and while planning my trip I was fortunate to get a specific locality from Steve Spomer and Matt Brust for one of these localized populations in far northwestern Nebraska. [Happily, that locality was very close to the locality where I would be looking for another priority species for the trip, C. nebraskana (prairie long-lipped tiger beetle)]. The site – a sandy roadside embankment – was characterized by a very fine-grained sand, which Matt Brust tells me the species appears to favor over the coarser-grained sands more typical of the Sandhills to the east. Success did not come easily – when no adults were seen at the site after two consecutive days of searching, I hedged my bets and extracted larvae that I hoped would represent this species for an attempt at rearing them out to adulthood in the laboratory. Persistence paid off, however – a hunch told me to make one more visit to the site after a couple days in the Black Hills, with two adults (and another C. nebraskana!) being my reward. The individual shown in the above photo was an unexpected surprise. It was captured a day later in the Sandhills proper at a locality where I expected to see not this species, but C. limbata (which I did succeed in finding at a nearby locality – see “Cicindela limbata – epilogue“). When I first saw this individual, I thought it was the ever present C. formosa (pictured below), which it greatly resembles and which, along with C. scutellaris, occurs commonly in suitable sand habitats throughout the Sandhills. Something about the way it flew gave me pause, however, and after capturing and looking closely at it in my hand I realized what it was. Cicindela lengi is distinguished from C. formosa morphologically by its slightly narrower form and longer, narrower labrum, but the quickest field identifier is the obliquely straight humeral marking (“C”-shaped in C. formosa). There are subtle behavioral differences also – both species are alert and quick to fly, but C. lengi lands quickly after a short flight, whereas C. formosa flies further and tends to land with a comical bounce and tumble or two across the sand. 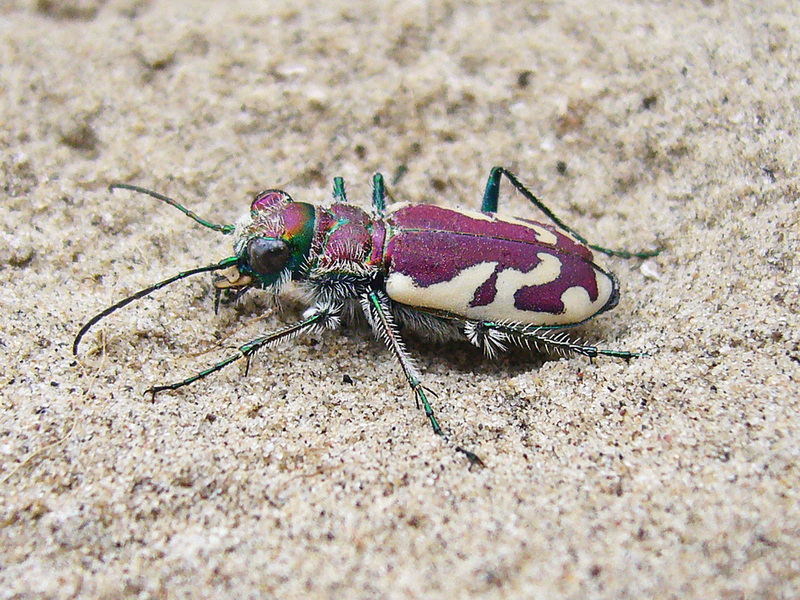 Cicindela lengi and C. formosa are not closely related despite their similar appearance – the former is assigned to subgenus Cicindela (Tribonia), while the latter is assigned to the nominate subgenus. The individual pictured above represents the nominate C. lengi lengi – populations north of Nebraska and Colorado exhibit a distinct coppery underside to the thorax and are assigned to subspecies C. lengi versuta, while populations in the southwestern part of its range show broadly coalesced elytral maculations and are assigned to subspecies C. lengi jordai. Spomer, S. M., M. L. Brust, D. C. Backlund and S. Weins. 2008. Tiger beetles of South Dakota & Nebraska. University of Nebraska-Lincoln Special Publication, 60 pp. I am pleased to hear that you eventually got to see and photograph your selected species. One has to have a lot of patience in nature but most times we are rewarded. They are very similar and I wonder why they were put into different genuses? I hope you and the family had a wonderful vacation and feel rested and ready to tackle the new year. Hi Joan – the similarity of C. lengi to C. formosa is an artifact of coloration. The subgenus containing C. lengi is characterized by its longer and narrower body, and the included species all bear similar markings – especially the obliquely-straight humeral (shoulder) marking. If the ground color of the other species included with it was the same they would all look very similar to each other. Species in the nominate subgenus – e.g. C. formosa – exhibit bulkier bodies and shorter legs, and the the two subgenera are further distinguished by details of the male genitalia. It’s a rather marvelous example of convergent evolution in a common habitat by two (relatively) unrelated species. “Alert and quick to fly” or run in some cases seems to describe most every tiger beetle I attempt to photograph — unless they are mating. Thanks for the additional Ted. Last year October I was down in one of our costal areas and took some pictures of a millipede. On looking it up I discovered there are 2 species who’s territory overlaps there and wondered if this was a cross between the two as it had similarities to both and yet look different. I believe this does happen but I have unfortunately not had anyone able to confirm this for me. I will be pleased when these holidays are over and things get back to normal. I seem to living in limbo at the moment!! Nice photos! The setae on C. lengi look more robust. If that is characteristic, I wonder if/how it is functionally related to substrate coarseness. I like your WordPress layout. Tempts one to consider switching. I had the pleasure of encountering lengi for the first time this past June in Colorado. It was on the east slope of the Rockies west of Denver. There was a very localized population on a steepish gravel slope along Clear Creek. I saw several dozen individuals- but none just 50 feet up or down stream. You got a much better photo than I was able to manage. I’m not sure what functional significance there might be between setal thickness and substrate. It’s an interesting thought – my first inclination would be that it has more to do with thermal regulation.